Andy Murray says he is playing the best clay-court tennis of his career as he heads into the French Open. The Briton won his first title on the surface in Munich earlier this month and followed up with victory over Rafael Nadal in the Madrid Open final. 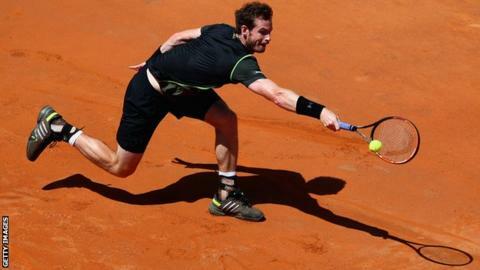 Murray, 28, is the third seed at Roland Garros and will face qualifier Facundo Arguello of Argentina in round one. "It's probably the best I have played on clay, for sure," said the Scot, twice a semi-finalist in Paris. "I never really felt particularly comfortable on the surface. Sometimes by the time I got to the French Open I started to feel good, but obviously winning tournaments and beating good players helps with the confidence. "I just feel like I have an idea of what I'm doing on the court. Sometimes in the past I have not really known what was happening on the court and felt like I was struggling with my movement. "This year it doesn't feel like that. I feel like I'm moving well. I feel a lot freer on the court, my body feels good. That's positive." Murray is in the same half of the draw as nine-time champion Rafael Nadal and top seed Novak Djokovic, who could meet as early as the quarter-finals. "I think Novak for me goes into the tournament as the favourite now," said Murray. "But on that court Rafa's record is ridiculous. It's completely possible that he gets out there and feels great, especially if he gets himself into the tournament and wins his first few matches." Murray is in Paris with French coach Amelie Mauresmo, who experienced the pressure of being a home favourite as a player but never made it past the quarter-finals in 15 attempts. "For me, that's one of the benefits of working with a player that's just played in the slams and done well in the slams," said Murray. "They are also aware of the pressures and stuff that comes with trying to win an event like this. "Amelie obviously put a lot of pressure on herself there, which probably wasn't beneficial for her performances, and can obviously give me advice and input based on her experiences of playing in these tournaments. "So it's good to have experienced ex-players around I think at these times of year." Who is Savage's manager of the year? Read more on Koeman? Monk? Mourinho? Who is Savage's manager of the year?